On Saturday night it was Wilson’s turn to have his special night with Mom and Dad. Wilson was so excited. He had been talking about it all week and could hardly sit still on the way to the Charlotte Checkers hockey game. 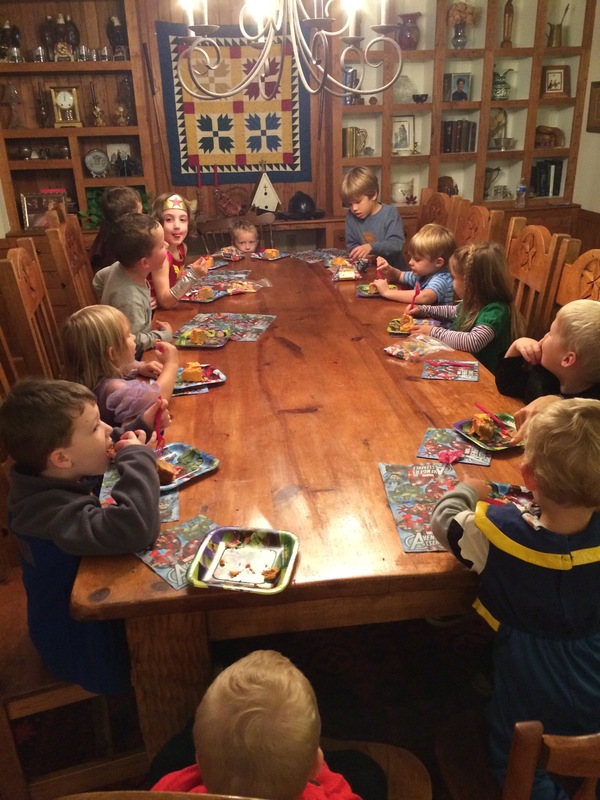 It is so touching to see how energized the kids are when they get to spend quality time with us. It makes me realize how much they need that personal time with Tom and myself. I am so thankful that this is what we decided to give the kids for their birthdays. It is a much better gift than the kind that they can unwrap. 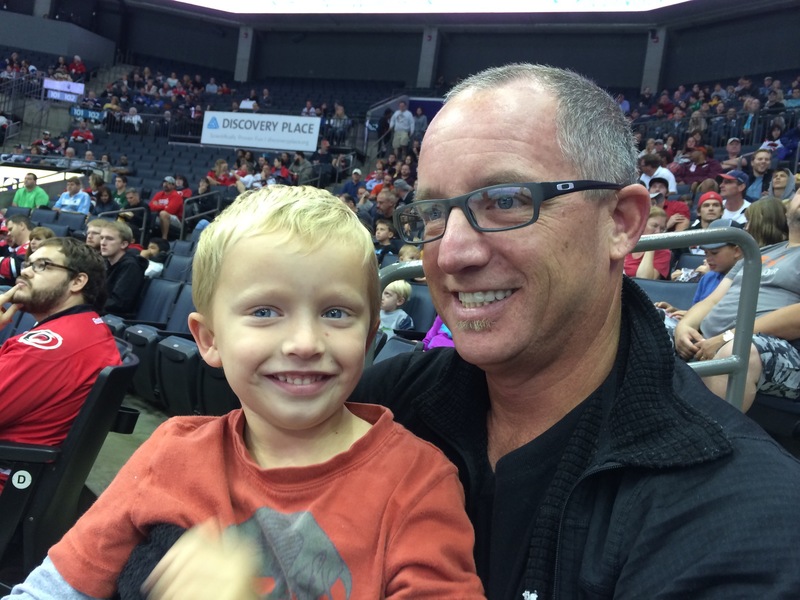 We arrived at the arena in time to find our seats and buy Wilson his special “treat” for the evening – he chose a pizza and a coke. (Yep, he even got caffeine.) We had great seats; they were near the goal and about five rows from the glass. The game started and Wilson was wide-eyed. 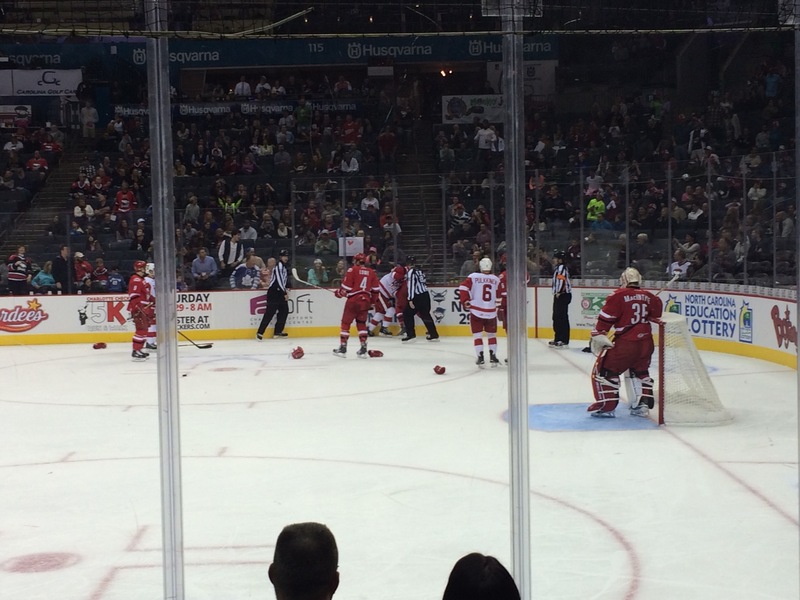 There was so much action….and fighting. I had forgotten how much fighting there was in hockey. There were grown men beating the hell out of each other while the crowd cheered them on. Of course Wilson loved it, but I had to remind him that the players were being very good sports. I think he really liked the fact that after each fight the players had to go to “time out” in the penalty box. For the rest of the game, he knew exactly how many players were in the penalty box. I guess he could relate…hahahahahaha…. We had such a wonderful time together that night. Wilson sat on Tom’s lap most of the night while I sat next to them, and we all cuddled under the blanket that we brought. I started to cry when the game first began because I realized that I don’t do too many special things with just Wilson. He is such an amazing boy, but when he was two I had just had another baby. He was squeezed out of his usual place in my lap. Him being a somewhat difficult child didn’t help either. At the game, I think I was crying out of guilt and a bit of remorse for the things that I hadn’t done with him over the last few years. Wilson is an amazing child and I am so thankful that I got to spend that time with him. I plan to do a better job of spending more quality time with him in the future. By 9:00pm that night, Wilson was ready to go home. He made it through the first two periods of the game, but was fading fast. I know that we will go to another hockey game this season. The other kids want to go next time as well. I never thought that hockey games would be a family event, but I guess they will be. This entry was posted in Uncategorized and tagged birthday, game, hockey, wilson on October 22, 2014 by Becca. to go out to dinner but I didn’t want to take the chance that we would start talking about sensitive subjects and end up arguing on our special night out (yes, that happens sometimes). I decided that the best way to avoid that situation was to go to the Comedy Zone uptown. We always have fun there. 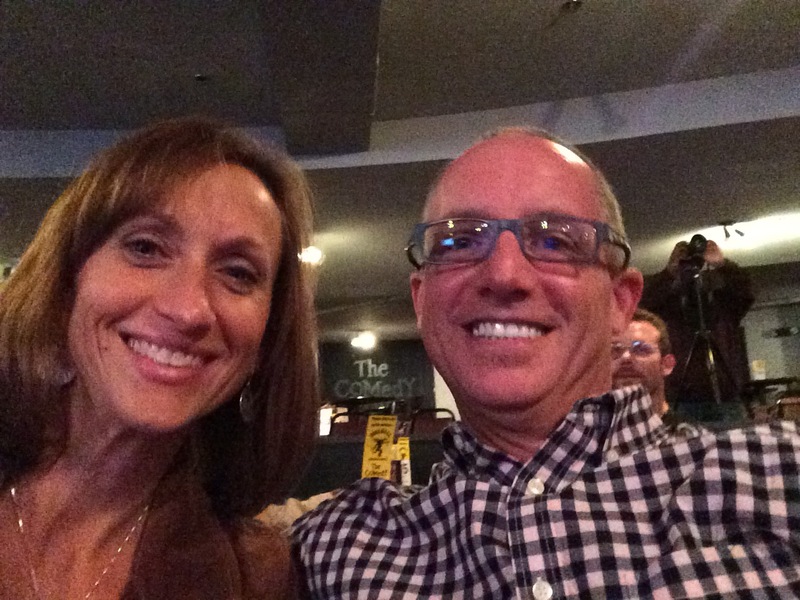 We needed an enjoyable night out together doing something fun and different ….and laughing. As usual, I had a Groupon that needed to be used at the Comedy Zone so I made reservations, got Sidney to babysit, and off we went. It was a lot of fun. Refreshing actually! Before the show, we belly-ed up to the bar and ate dinner at the Mexican restaurant upstairs from the club. Then walked down to hear the comedians. There were four comedians total and two of them were quite funny. Oddly enough, we had seen the headliner last year when we went to the Comedy Zone with some friends. It was a great way to spend our anniversary – no kids, no serious conversation, and lots of laughter. 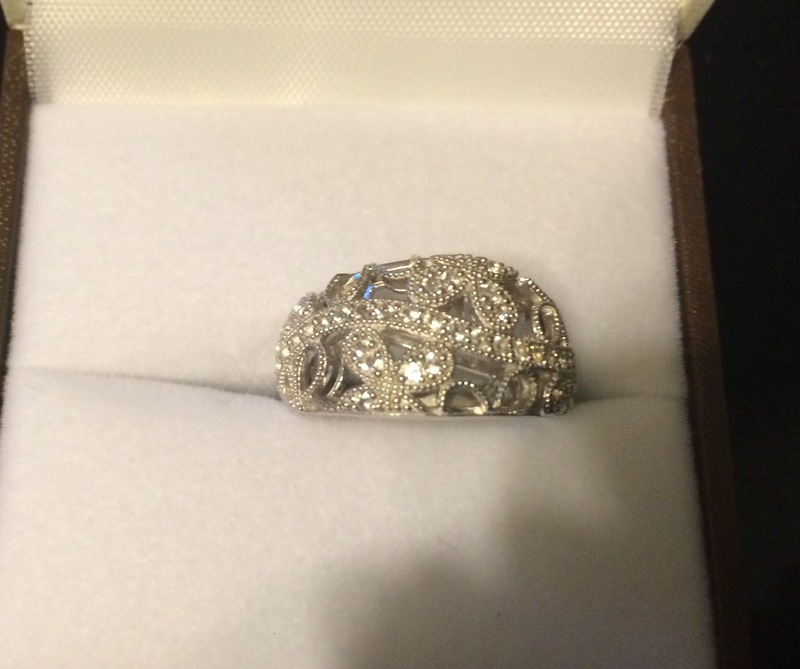 This entry was posted in Uncategorized and tagged anniversary, Becca, ninth, tom, wedding on October 22, 2014 by Becca. 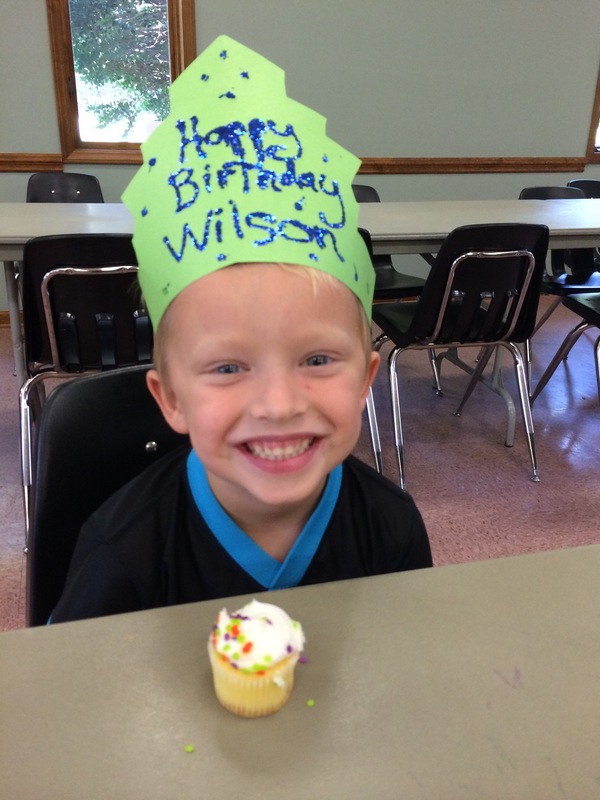 On Sunday my little Wilson turned five-years-old. He has grown up so much over the last six months to a year. He is so much more mature and kind to his brother and sister. He uses bigger words and seems to understand things more logically. Maybe it is because he is going to school four days a week, but maybe it is just because he is getting older. Lately, Wilson has begun to build things with his Trio blocks. He gets a bit upset if the spaceship he built breaks, but then he just builds another one and moves on. It is so neat to see him mature in so many ways. Wilson’s favorite thing in life are: play “baby”, sword fight, play spies, watch television and drink milk/juice non-stop. He also loves his friends from school, and they love him. He is quite the ladies man. One parent told Tom that the girls all love Wilson because “he is respectful and makes them laugh.” What more can you ask for as a parent than that?!?! Wilson is my little cuddler and I love it when he crawls into bed with me in the morning and snuggles in. He is a sweet and active little five-year-old. 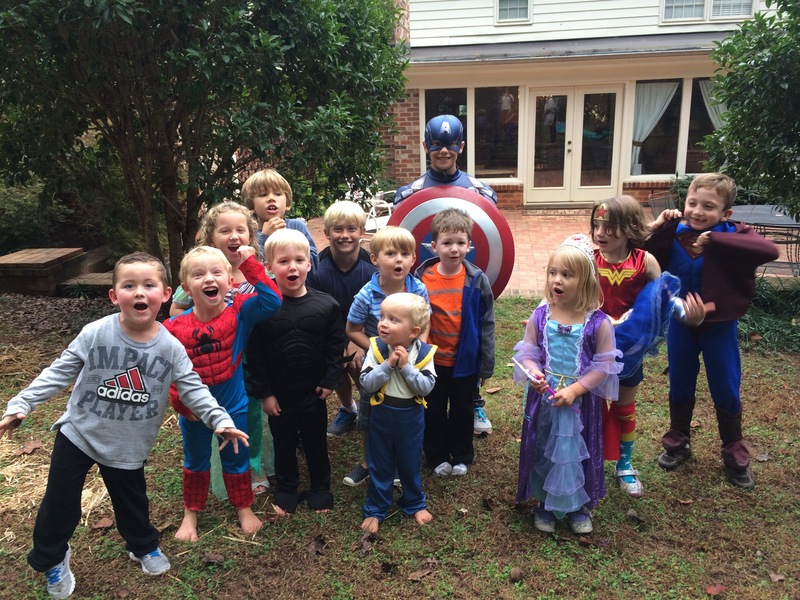 For his birthday he wanted a Super Hero party with Goldfish, Pirate Booty, and juice boxes. (I don’t typically buy those food items….you know, GMOs….) It was his birthday so I let him have whatever food he wanted. I even bought him a pinata and filled it with lots of yummy candy. Of course, I offset the candy with my deliciously homemade, all natural, gluten free, GMO free cake. I can’t completely cave, people!! Mom and Dad offered to have the party at their house so that I wouldn’t have to rent the shelter at the playground. The kids could jump on the new trampoline and play in the backyard. 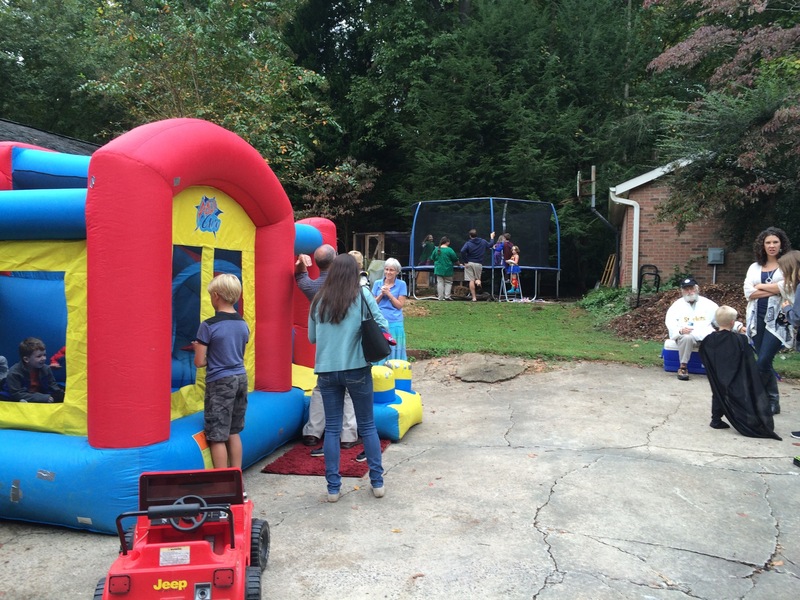 We even brought over the bounce house from my Aunt Lisa’s and set it up in the driveway. It was perfect!! All of the kids from school that he specifically wanted to invite were there, along with his cousins and some friends from church. Here is what it looked like…. 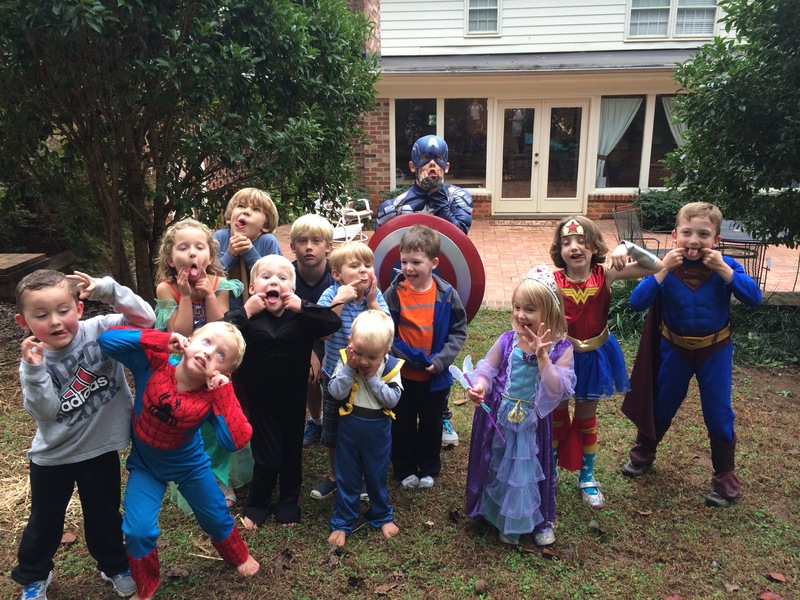 Here are all the kids along with John dressed up at Captain America. Every normal picture must be followed up by a silly face picture…. 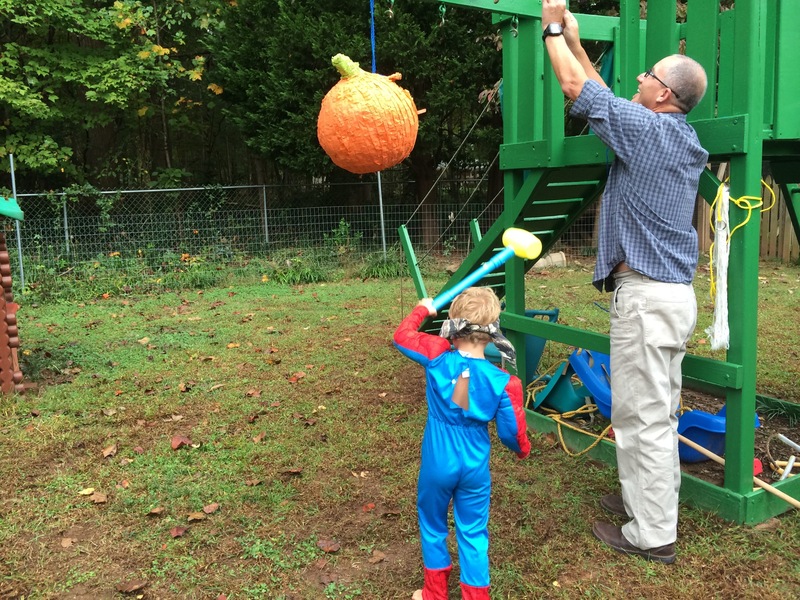 We tied the pinata to the swingset and let the kids hit it with a plastic hammer. This worked great because each kid could hit is five times and it still didn’t break. Eventually the pinata fell to the ground and then Tom held it while Wilson beat the crap out of it with a real stick. There was more than enough candy for everyone. 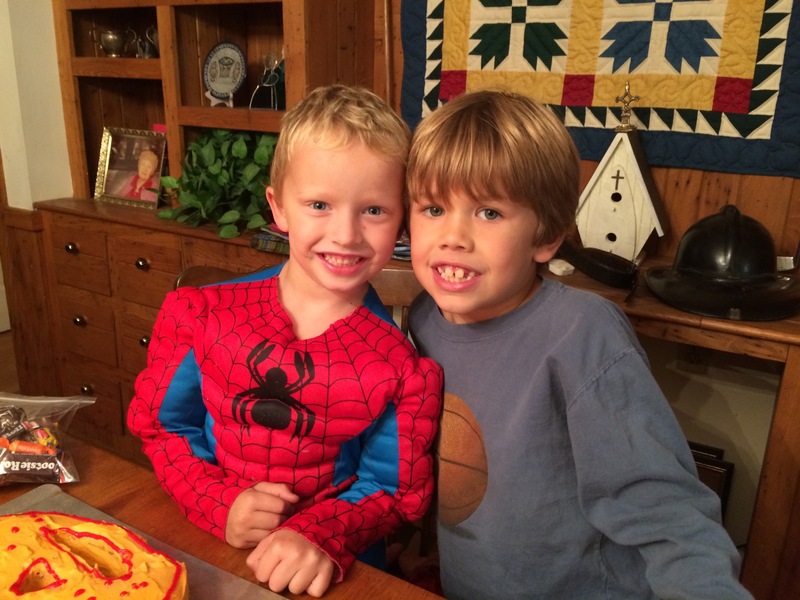 Wilson and Robin Youngs….great buddies…..
Wilson is my sweet little five year old!! He is such a joy to be around. He tries my patience like the best of them, but deep down he just wants to make everyone laugh and to have a good time. Here he is at school with his birthday crown on. Happy Birthday Wilson!! 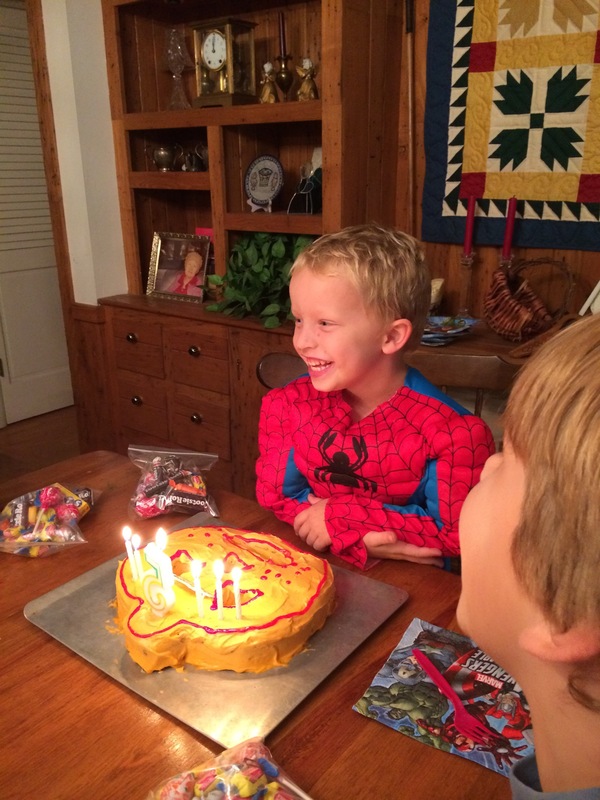 This entry was posted in Uncategorized and tagged 5, birthday, five, party, wilson on October 16, 2014 by Becca. Faith has been living on a cement floor for almost three years. Her room in downstairs on the basement level and it rarely used. I have refused to put carpet down there because I think that carpet is dirty, covered in chemicals, and collects dust (which is terrible for a girl with a dust allergy). 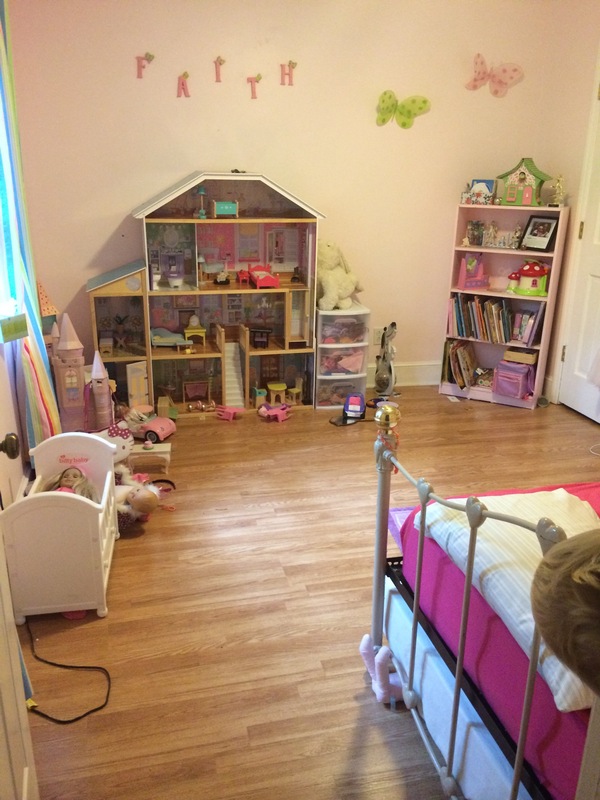 For years we have been talking about laying laminate wood flooring in her room, but have never done it. When I bought my new, beautiful, french door refrigerator from Lowe’s a few weeks ago, I decided to open up a Lowe’s credit card so that I could get a 10% discount on the refrigerator and Faith’s flooring. 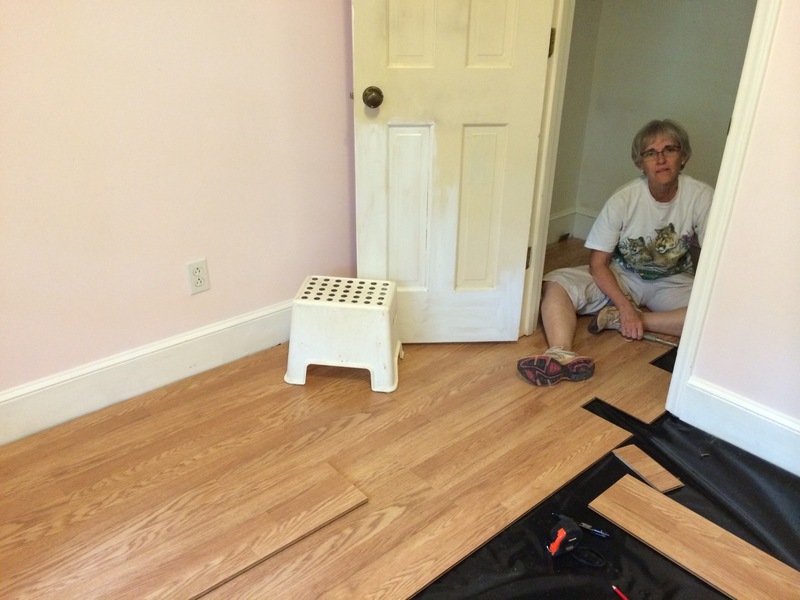 As I do for most of my home repair projects, I asked my mom to come and help me. She is probably the smartest woman I know and she is handier than most men I know. 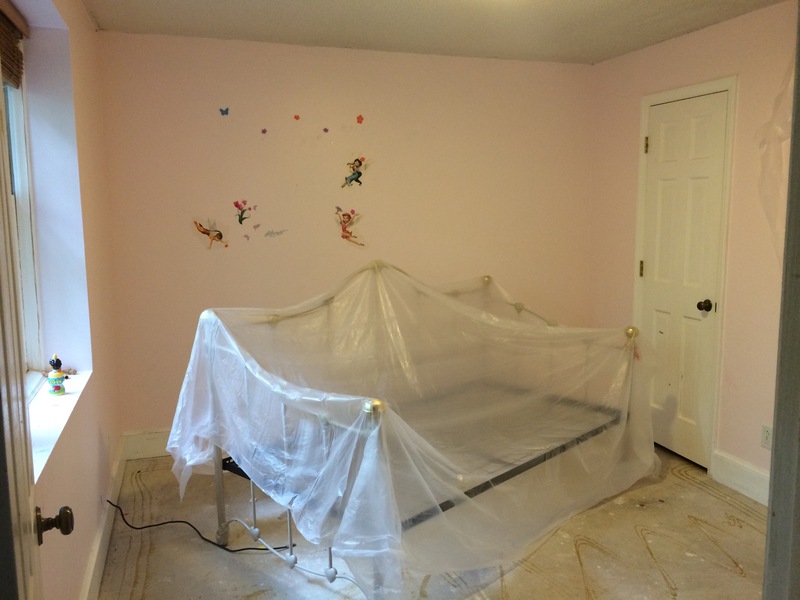 Of course, my new rule on project is this: “If you are fixing the floors, you might as well fix the ceilings first.” In our house, this means that that the popcorn ceiling MUST go! Tom was out of town that week so I had plenty of time to work on the ceiling. I have gotten pretty cocky when it comes to scraping popcorn off the ceiling. This time I literally brought the garden hose in through the window, turned it on low, and sprayed water on the ceilings. After that I could easily scrape the popcorn off. It only took about an hour to 1.5 hours to scrape the ceiling. Yes, my arms and neck were tired, but it was totally worth it. The next day I spackled the few spots that needed it, sanded a few spots and then just went for it – I painted the ceiling white that night. In all truth, I had a margarita that night and thought to myself at about 10:00pm, “I should just go paint the ceiling.” So I did! It was easy and looks great! I am so glad that I took the time to make her room even better. 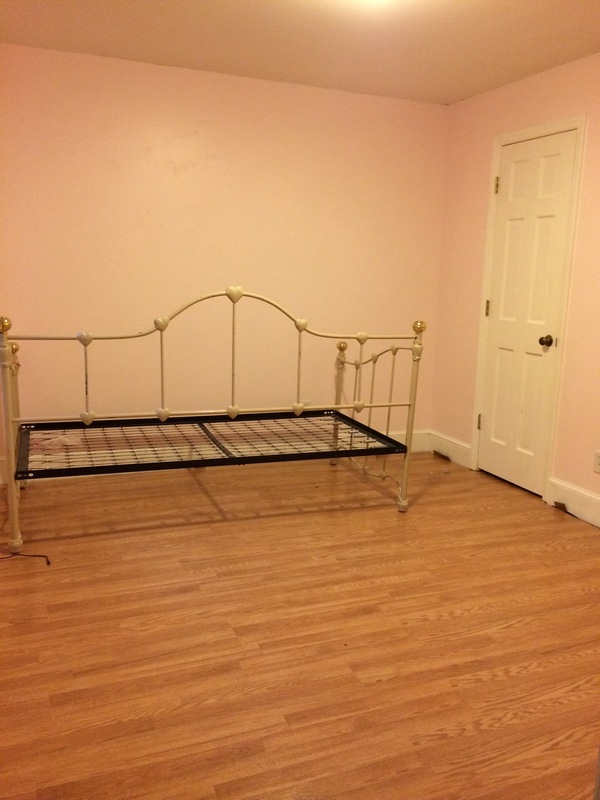 Here is the room after I took everything out of it except the bed…. I am somewhat of a “cut corners” kind of gal. 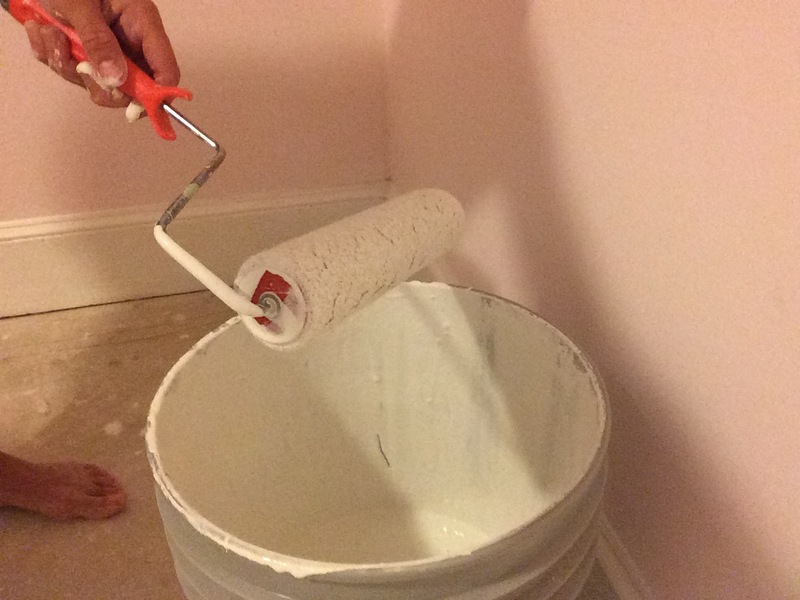 While painting the ceiling I literally just put the roller into the giant bucket of ceiling paint that was left over from the last time we painted the ceilings…..
After the ceilings were done, It was time for the floor. Mom brought over three different types of saws and we went to work. Laying laminate floors requires two brains working on the same project. Mom and I laughed so many times because we kept getting confused and reminding each other how to lay the floor. I think I came up with the same bad solution to the same problem numerous times. We had a great time working on the project together. Mom and I both love a good project so doing this together was just pure joy. 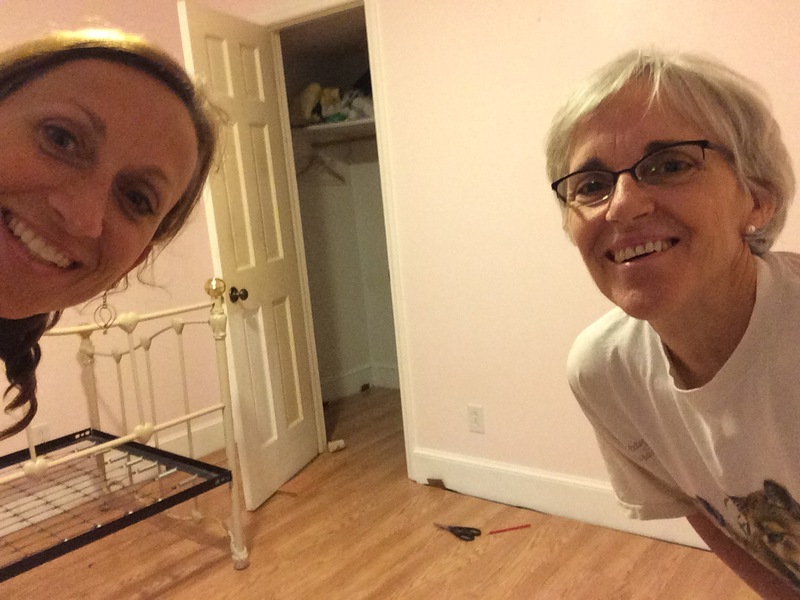 This entry was posted in Uncategorized and tagged Faith, floor, laminate, mom on October 14, 2014 by Becca. 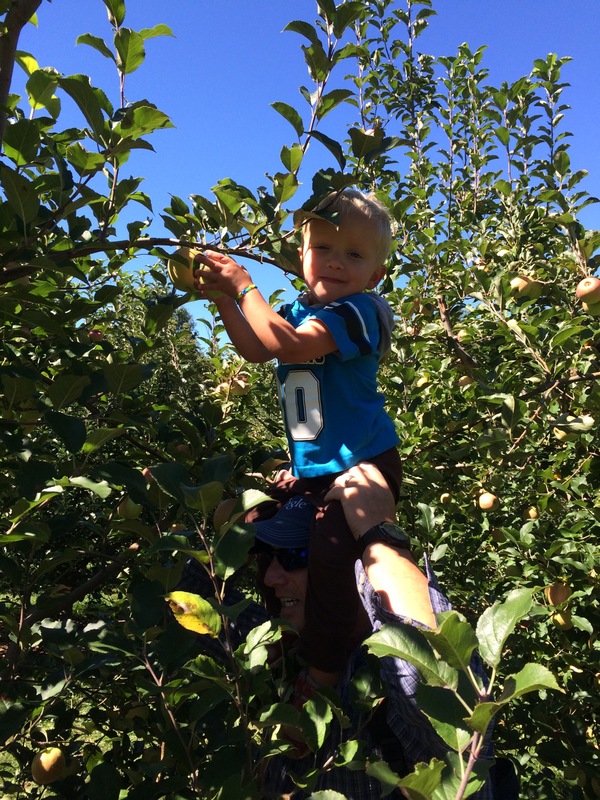 My Aunt Lisa told me numerous times how much fun their family had picking apples at the Sky Top Orchard in the fall. 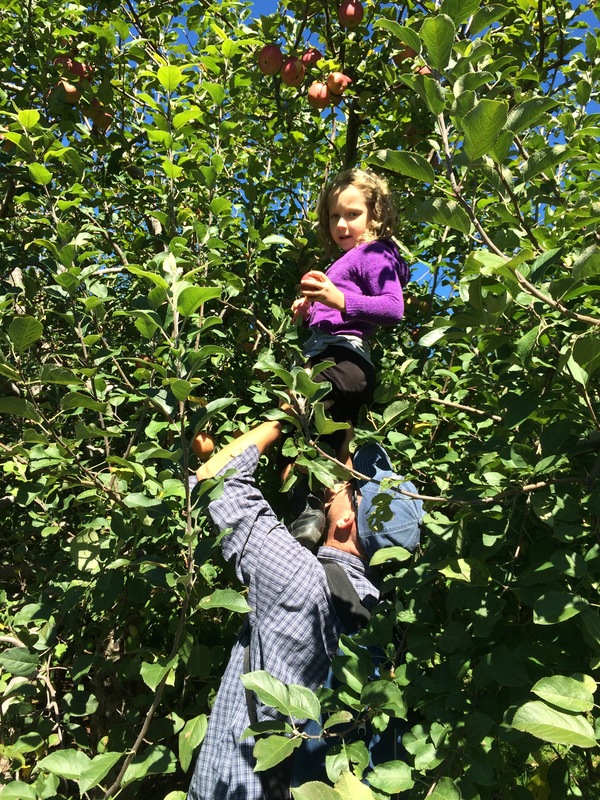 This year I decided that the kids were old enough to enjoy picking apples and I actually remembered to schedule a time to go. (The latter typically being the issue.) At the last minute, we decided to skip church on Sunday and drive up to the mountains for a fun, family adventure. We were in need of a day dedicated to having fun together. There are so many things going on that we rarely get to spend an entire day together with just the five of us. We woke up Sunday morning and finally hit the road around 10:00am for a two hour drive to the mountains. Amazingly, the kids didn’t watch the iPad until we were almost there. Faith and Wilson played and lovingly annoyed each other most of the trip. We went old school! When we did arrive, I was amazed at how many people were at the orchard. The huge parking lot was full. Luckily, we found a spot right next to the gate (this would come in handy later on when we needed to carry 30 pounds of apples back to the car). 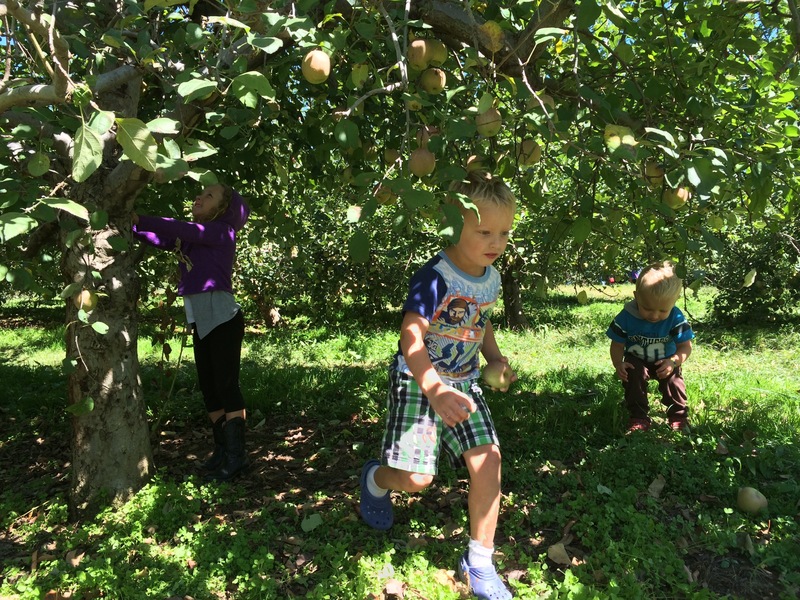 This orchard had it all: a playground, an apple orchard, grass to lay in while the kids played, a bamboo forest, and doughnuts. 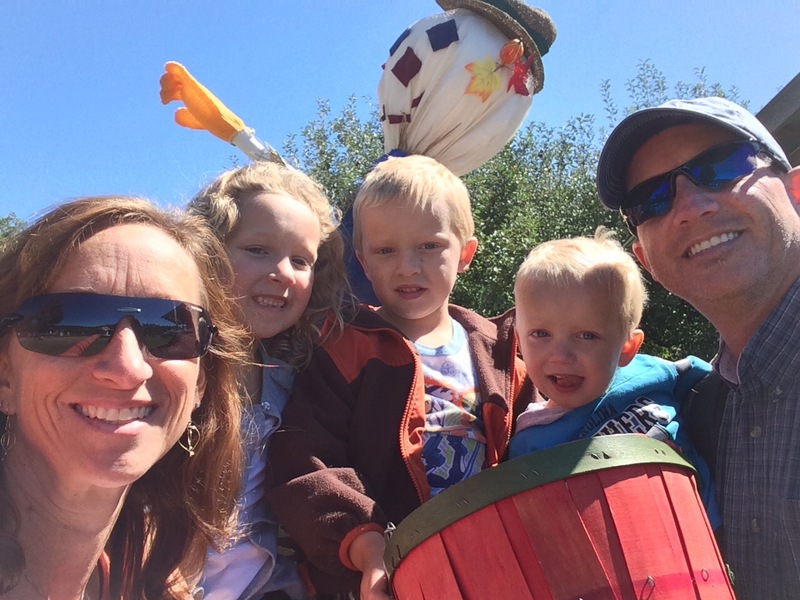 Here is our family selfie…. 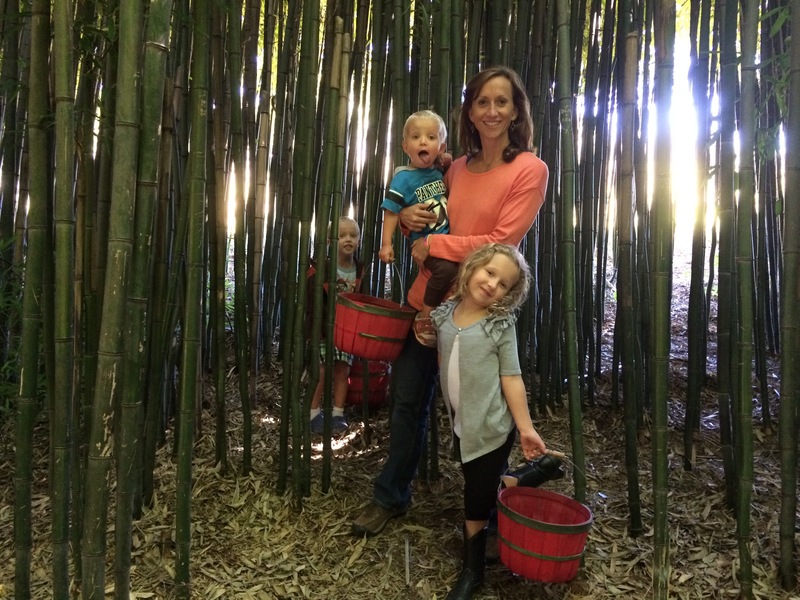 I love this picture of us in the Bamboo forest with the sunlight shining through the bamboo (Wilson is in the background)…. Thankfully we had a map so that we could find the types of apples that we wanted. I discovered quickly that some apples taste much better than others. I decided that taking a bite of an apple was worth breaking the rules so that we could limit certain varieties. I know that we will be baking with some of the apples we bought. Others will be going to Faith’s school as snack for the class (Thanks for the idea, Nikki!). I gave a full bag of them to my mom so that she could feed them to all of the kids that will be over there this week. Some of the apples were hanging within reach of the kids. I was surprised by the number of good apples on the ground…. 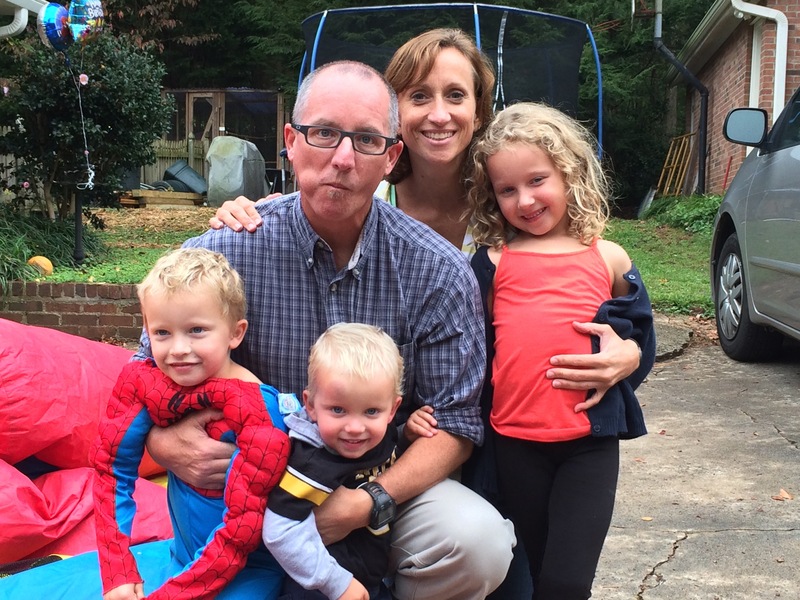 Tom lifted up Faith and Miller so that they could reach some of the “Pink Ladies”…. 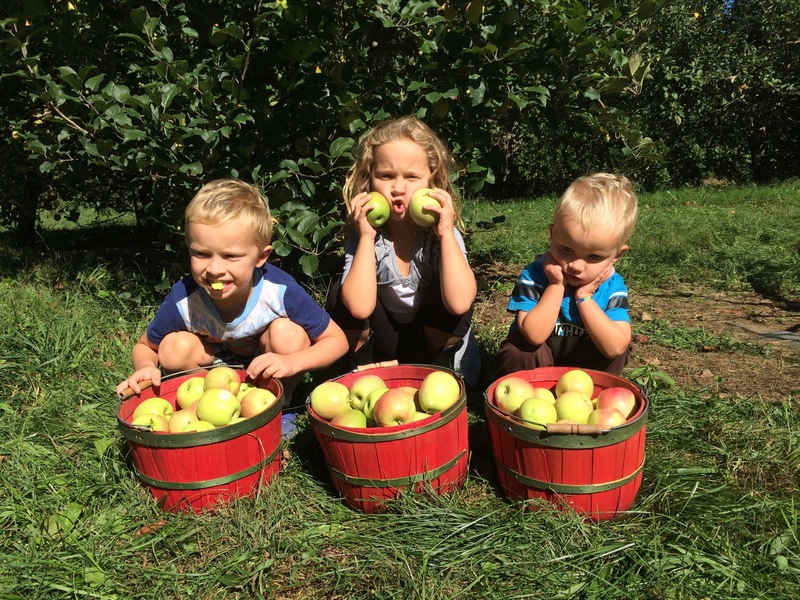 I am glad that I grabbed only three small baskets for the kids to put their apples in. These three baskets contained 30 pounds of apples. I am also very glad that the apples only cost $1.09 per pound! Along with its apples, this orchard is also known for its apple doughnuts. When we first arrived the line for the doughnuts was about twenty minutes long. I thought for sure that the line would get smaller as the afternoon wore on. Unfortunately, I was wrong. By the time we were ready to buy doughnuts, the line had doubled and there was a forty minute wait. Tom got into the doughnut line while Faith and I waited in line to pay for the apples. Being the good husband that he is, Tom waited in the long doughnut line while I relaxed in the sun holding Miller as he slept. The doughnuts were incredibly delicious. They were similar to a Krispy Kreme doughnut, but were covered in cinnamon and sugar and were a bit greasier. We only got six of them, but next year we will be getting a dozen. One just wasn’t enough. We had a wonderful day outside together while doing something different. Different is what we all need every once in a while. We needed to break out of the usual pattern so that we could enjoy life and enjoy each other. 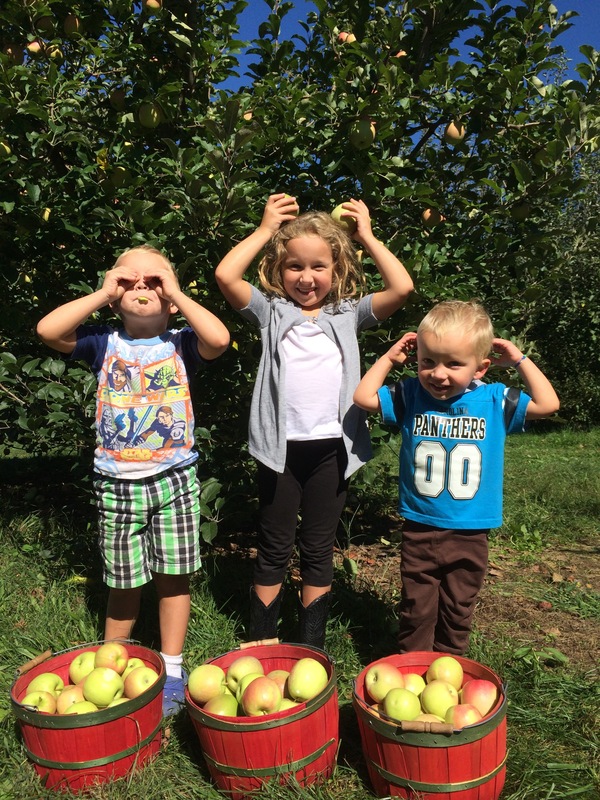 This entry was posted in Uncategorized and tagged apple, orchard, sky top on October 5, 2014 by Becca. It is always hard to know what to get the kids for their birthdays. They love to unwrap things but it isn’t always what they want or what we want sitting around the house. This year tom and I decided to give the kids the gift of time, personal attention, and a fun event. 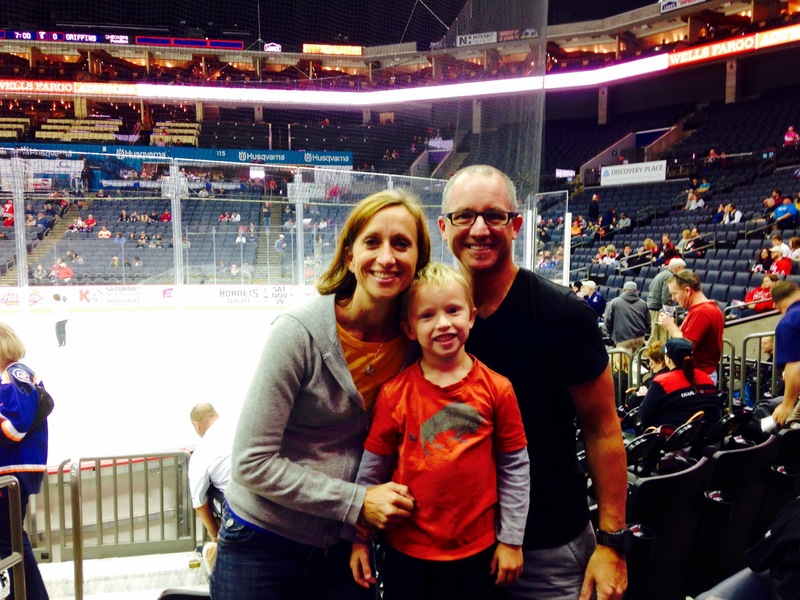 We three bought tickets to Disney on Ice and three tickets to a Charlotte Checkers hockey game. Tom and I would take one child to each event and Miller would get a trip to the ice cream shop with us. 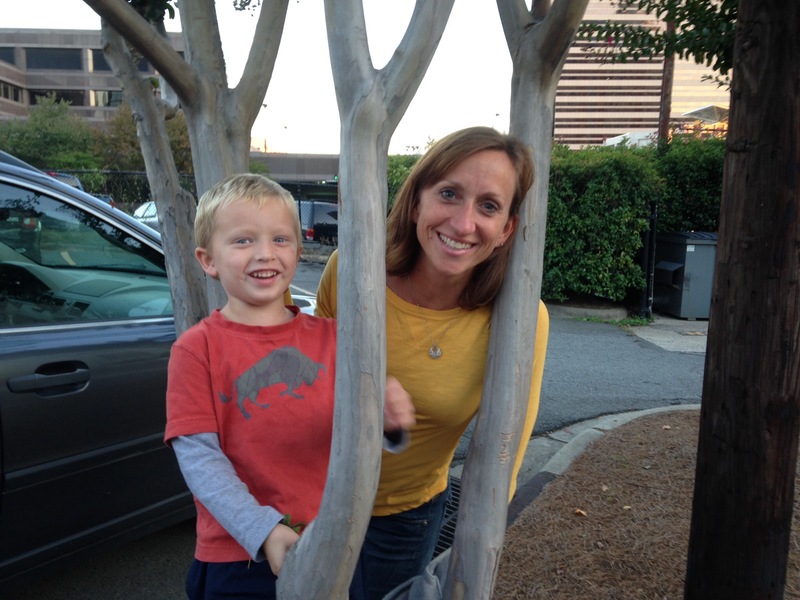 It is rare that one child gets to go somewhere with both Tom and I, and with no siblings. This would be a special night for each child. All three kids’ birthdays are within the next six weeks so now is the time for gifts. Faith’s gift was scheduled first so we had to give them their presents early. I printed out three pictures, put them in three separate envelopes and handed one to each child. 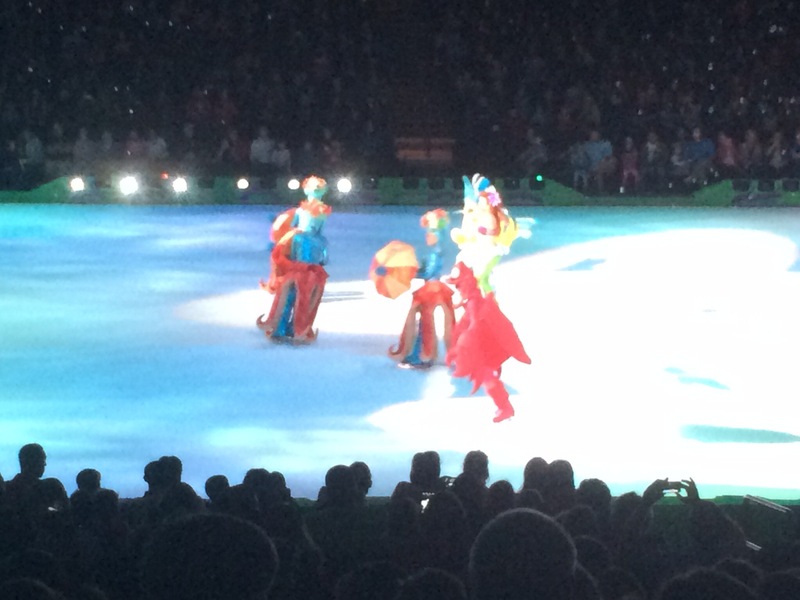 Faith opened up a picture of Disney on Ice: Princesses and Heros. There was also a letter saying the she would be spending a special night with Mommy and Daddy. Wilson opened his tickets to the hockey game along with the same note. Miller opened a picture of an ice cream cone with a note as well. They were all very excited. 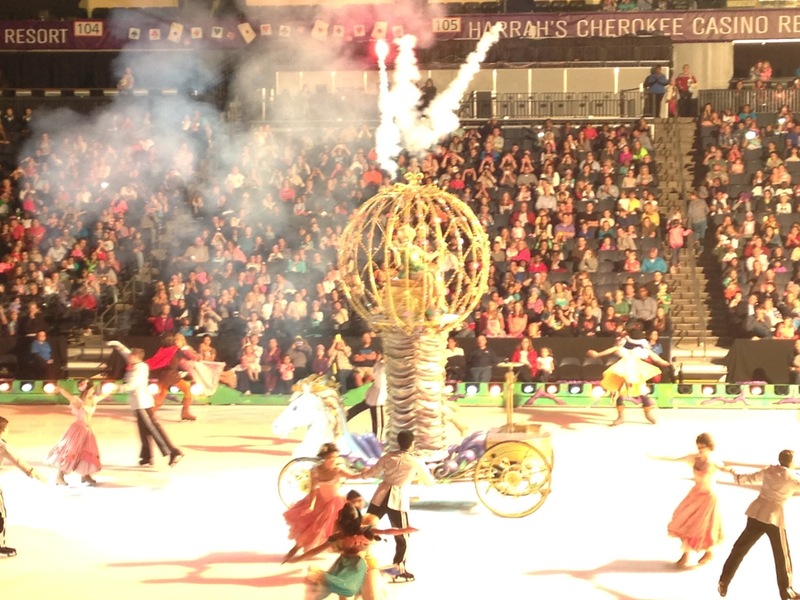 The next night was Faith’s Disney on Ice show. It was a cute show. All of the Disney princesses came out, sang a song and danced with her prince. Faith thought it was awesome. I am sure that is was in the eyes of a six year old. It was fun hanging out with faith and doing some thing that she enjoys without the usual interruptions from her brothers. She reveled in the one on one attention that she got from us. I almost cried just knowing that we could give her such joy and help her to experience something new and exciting. 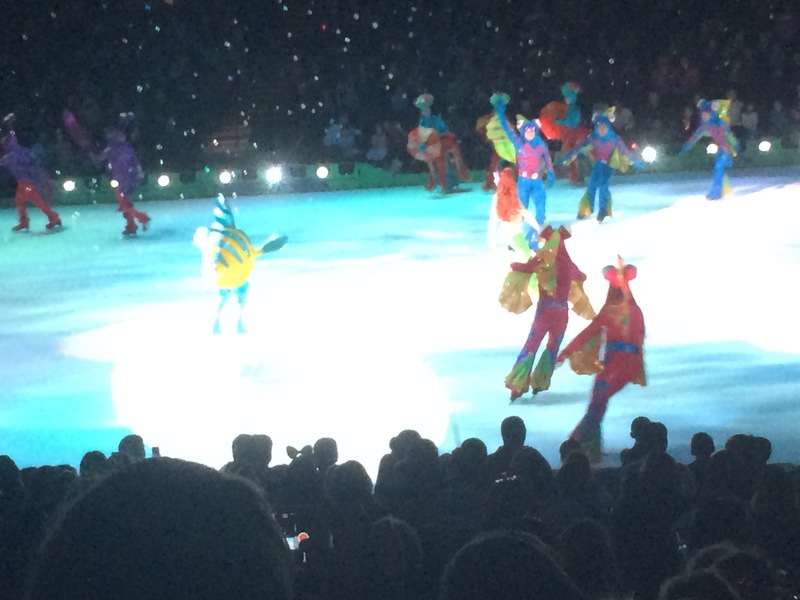 This entry was posted in Uncategorized and tagged birthday, disney on ice, Faith on October 5, 2014 by Becca.